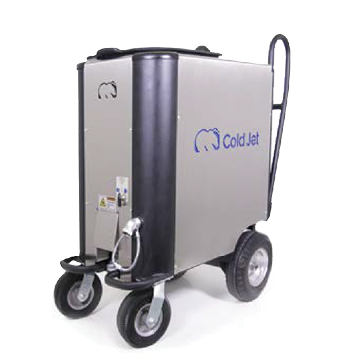 Also known as dry ice blasting, is a revolutionary cleaning method that use dry ice pellets (CO2 in solid form) as a blasting media. 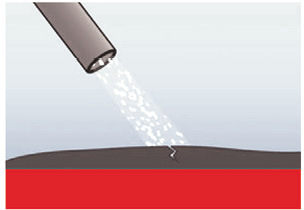 The result is a completely dry, non-abrasive cleaning method with no secondary waste. Dry ice is a food grade media. Dry ice cleaning is a 3-step-process. 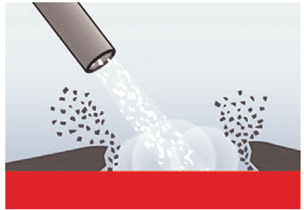 Dry ice pellets are accelerated by compressed air to high velocities, thus impacting the layer and provoking fractures. The low temperature (-79° C/-110° F) causes the coating to become brittle, crack and loosen. This allows dry ice to permeate the coating. The dry ice turns from solid into gaseous form (sublimates), expanding its volume by a factor of 700. The expansion lifts the coating off the surface. Dry ice cleaning is a green substitute for environmentally harmful methods, such as chemicals and solvents. 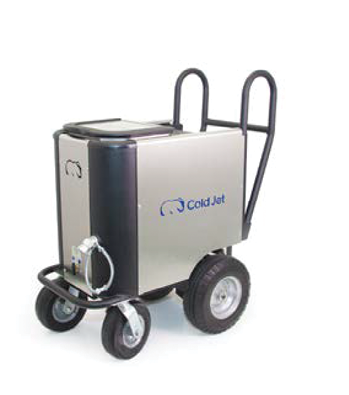 Dry ice provides the perfect, environmentally responsible cleaning media. 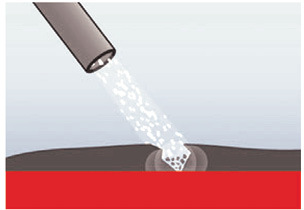 While materials such as sand, water, etc. become contaminated when they come into contact with hazardous material, dry ice is eco-friendly because it turns into a gas upon contact, and therefore cannot become contaminated like other blasting media. With an ergonomic design and simple operation, the Evolution Line provides an efficient and effective cleaning solution that is superior to other methods. Its operational versatility makes it suitable for both lighter applications and heavy duty cleaning.